The first day of streams for Celebration was really an explosive opening. 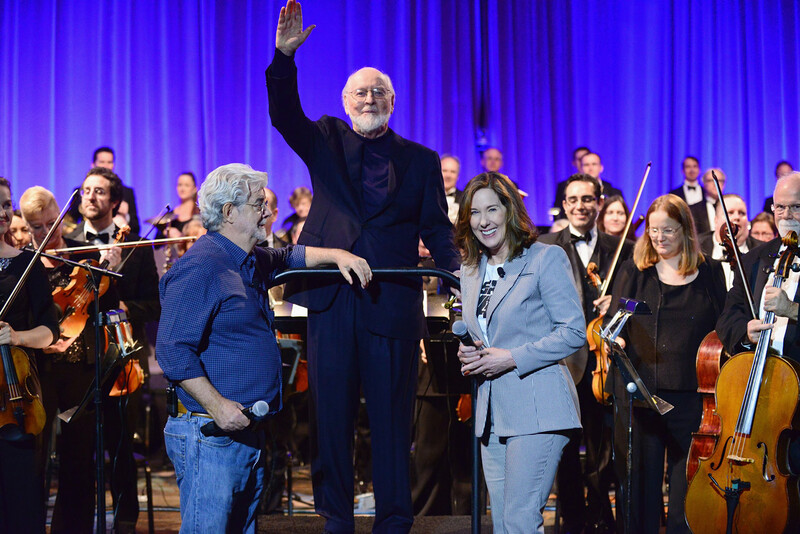 The 40 Years of Star Wars panel had surprises galore, and nowhere was that apparent than George Lucas being introduced on stage by Kathleen Kennedy. Lucas stayed on stage to interact with the other guests that appeared, and they came in force. Dave Filoni and discussion of how George was a mentor to him throughout The Clone Wars. Hayden Christensen appears at his first Celebration since 2002, and he is joined by Ian McDiarmid, as the two discuss their roles with particular emphasis on Revenge of the Sith and the opera scene. The Tragedy of Darth Plagueis The Wise. This is brought up again during McDiarmid's panel, with quite a bit of time spent on it. Liam Neeson and Samuel L. Jackson had messages for the fans, and the videos had both words of wishing and wit, as both say what an honour it is working on Star Wars. Neeson teases with fans saying he's on the set of a Jar Jar Binks movie, and Jackson recites a particular theory of Windu still being alive and how he wants it to happen. Anthony Daniels, Peter Mayhew, and Billy Dee Williams are brought on stage to discuss how their characters came to be. Mark Hamill gets introduced and yet another bombshell as Harrison Ford arrives. Character origins are brought up again, and by this time I feel as though the fun interplay between all these people have made this panel a great opening for Celebration, and a celebration of Star Wars' 40th anniversary. It's also a time of remembrance though, as Carrie Fisher passed on. Lucas and Kennedy say touching tributes, and Billie Lourd - Fisher's daughter - brings the final words home. A tribute video plays celebrating all that Carrie Fisher brought to the franchise and the world, and that lasting memory was bringing tears to the eyes of fans. Yes, I felt the tug of heartstrings as well. You thought this thing was over though? Oh, no. A 40 year celebration should only be played out one way. Bring out John Williams, and an entire orchestra to play out Princess Leia's theme, followed by the opening and closing themes to the original film. And what better way to end out the panel than with the Imperial March. Animated Origins had some interesting bits of information, as we got talk on bringing Maul into The Clone Wars, and his end in Rebels. Ahsoka and Rex were brought up, and teasing of season 4 of Rebels ensued. Those on the stream didn't get to see what those actually at the panel saw on the screen, which was quite a shame as they showed off a clip of an arc from The Clone Wars that never got finished. It involved Cad Bane and Boba Fett in something resembling a western-styled duel from what Filoni said about it. The insights continued with the first guest panel on the stream. Ian McDiarmid talked in more detail about that opera scene in Revenge of the Sith. The talk itself was informative, and we got to hear about how he influenced the character of Palpatine with Return of the Jedi and how returning to a younger version of said character in the prequels helped him understand what Palpatine was like. McDiarmid also did his famous Palpatine laugh, and an interesting question from the audience asked about how other characters he has played influenced Palpatine and vice versa. And I said in Pre-Talk, the guest I always look forward to seeing is Ray Park. Again talking influences of the character, some insights were given to Maul, Park's martial arts, and his cameo as a Naboo Guard with the group protecting Padme in the final fight of The Phantom Menace. The earring mention was an interesting fact I also didn't know about the character of Maul, so this panel was informative as well as fun. 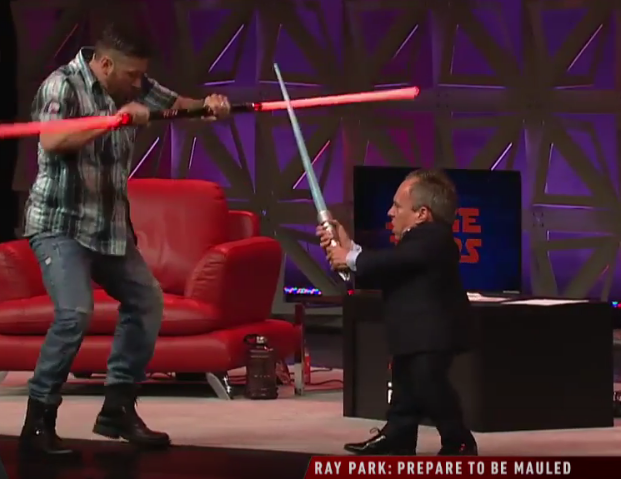 And of course Ray Park and Warwick Davis were going to recreate the final duel again. Which was hilarious when Davis realised he needed to pretend he'd fallen down a shaft and had no way to get back up - being lifted up by the audience. The Star Wars Show had one last interview up its sleeve, preparing for some of the Rogue One panels the next day. Who should also be along but Sam Witwer - voice of Darth Maul. He joked about no longer having a job due to Maul's death, having to work with the prop builders, and also teasing that Maul's legs were still kicking about and would be a focus of season 4 of Rebels. Friday brought us some good panels. Some funny moments and witty tales. And some more serious stuff as well. And the first panel - The Last Jedi - was something. Kathleen Kennedy and Rian Johnson take the stage to offer the first few words, then one by one cast members are brought on, Daisy Ridley, John Boyega, new girl Kelly Marie Tran, and Mark Hamill. There were interesting moments with the talk, and Kelly is playing a new character with Rose - someone within the Resistance working within maintenance. A bit of set-up for the film that was said at the panel was that the First Order is taking advantage of their destruction of the Republic to create chaos within the galaxy. Nowhere is that more apparent than when we see the trailer, and a war is going on - both at the Resistance base and up in space. And that trailer! It certainly did a good job of teasing us. Leaving us wanting more. Rey's training. The aforementioned battles. A sight of Leia. A sight of Kylo Ren. Captain Phasma with a squad of troopers surrounded by fire and the debris of battle. And that final line. "I only know one truth. It's time for the Jedi to end." From my point of view the Jedi are evil we can piece together what that could mean from certain facts. An interesting mention during the panel was how meeting your heroes can sometimes leave a bad impression of them. We know Luke left because Ben turned to evil. Luke has probably been hunting the first Jedi Temple looking for answers. Is this the way forward, sort of thing. Is there another way? So while he agrees to train Rey, he isn't doing so as a Jedi, and he certainly isn't teaching her anything of the Jedi. Rey would try to get through to him, and bit by bit we get the history of all that happened that would make him withdraw, and lose trust in the Jedi way. As for the full trailer, it left me with chills. Especially that last line. Those chills would always return upon another viewing of it. The other three panels of the day were memorable, for different reasons. Our first with Warwick Davis had him hosting a panel and being the guest. Members of the audience were brought up on stage to ask questions, and some were funny. One of the first asked what flavour ice cream he liked, with the reasoning being that the person felt he'd be asked a lot of Star Wars questions so wanted to ask something a little more personal. The interactions between those audience members and Warwick were certainly entertaining, with the occasional 'Better Question' being given by Warwick on a card when he felt the question asked wasn't much. He showed off some rarely seen clips, such as a house tour as Griphook from when he was filming Harry Potter and the Deathly Hallows, and from the set of Return of the Jedi came Return of the Ewok, a cute video showing eleven year-old Warwick searching for his destiny and coming across Star Wars. The Heroines of Star Wars panel gave us some interesting insights on how strong female leads are made and a mention of the first time Hera and Sabine were alone. That was interesting, as Filoni mentioned how the two were having a talk of relationships but it never felt right, and when that scene was cut, it made the characters and the episode stronger. Filoni is always a laugh on these panels, and here was no exception. When Daisy Ridley, Ashley Eckstein, and Tiya Sircar were presented with Forces of Destiny figures of their characters, Filoni joked that Amy Ratcliffe - who was hosting - said everyone was getting one. Where was his? It was certainly a fun few minutes of teasing. Of course, the most memorable of the three would be Mark Hamill's tribute to Carrie Fisher. It had funny moments, and serious moments. 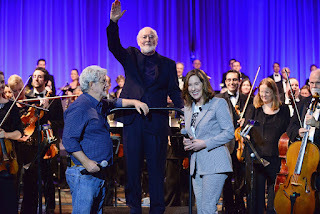 It had stories from on set, with George Lucas and Kathleen Kennedy giving video messages. In all of this, you could tell the grief was there, those feelings still raw. But as Mark said, Carrie wouldn't want us to grieve. She was a fun lady to be around, full of wit and charm, and would rather everyone remembering her for all the good times, and being happy, as she would always be with us. The panel is well worth a watch, as it gives an insight to the wonderful woman that Carrie Fisher was. Warwick Davis even gave his view, and brought a reel of highlights from Carrie's time at Celebration. As I say, well worth a watch. Now, I can already see this is getting to be a large post. With only two days worth of panels. I know tomorrow is my most looked forward to day, so I expect quite a lot for that day, which will probably double the size of this post with just two panels of that day. As such, I'm calling a stop here, and a second part will be added for the next two days. That part will have my overall impressions of the full Celebration as well. So, enjoy the next two days worth of panels, and the next post will be in three day's time.